Bayer’s $62 billion bid for Monsanto, as of this writing, has been rejected, but both parties say they are continuing to negotiate. That the “Joy of Six” agricultural input companies may soon become a ménage à trois has been a matter of speculation in ETC Group since mid-2014. If (and it is a big “if”) the marriages of Dow with DuPont, ChemChina with Syngenta, and Bayer with Monsanto are consummated, the only wallflower left on the dance floor, BASF, will either have to hook up or give up. Agriculture is, relatively speaking, small potatoes for the German chemical giant, but, still, it brought home $7.2 billion in crop chemical sales in 2014 and commands a hefty 11.5% of the global pesticide market. Although BASF invests in plant breeding and breeding technologies, it doesn’t directly sell seeds. Instead, the company collaborates on R&D all along the food chain – with Monsanto (developing GMO traits), with Yara (producing ammonia for fertilizers), with synbio company Evolva (developing biosynthetic pesticides), with Cargill (developing oils high in omega-3), with Deere & Co. (selling crop insurance, precision agriculture) – and it has cross-licensing deals with major seed companies including Monsanto, DuPont and Dow. 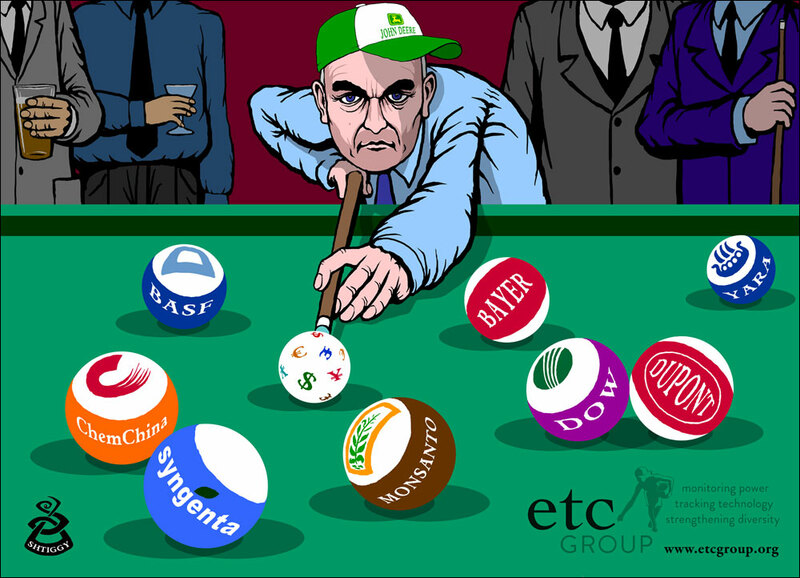 [i] BASF could give Bayer a run for its money wooing Monsanto, or it may decide its dance card is full enough. Or, the company may choose to spin off its Plant Science business altogether. If so, one of the top three farm machinery companies could be a buyer: Deere & Co., CNH or AGCO (in order of sales). At first glance, the timing seems wrong. Not only are seed and crop chemical companies in deep doo-doo with sales dropping and debts climbing, but the farm machinery business is even harder hit – with farmers unable to pay out for big-ticket items like tractors and harvesters, high prices for steel and depressed markets in emerging economies like China and Brazil affecting their agricultural imports and exports, respectively. Could Deere & Co., CNH or AGCO really change their business plan so completely as to take over seeds and pesticides? In the midst of the general downturn in agricultural markets, it seems a bit fanciful, but consider that Deere and AGCO have already entered strategic alliances/partnerships with all of the “Big Six” agrochem/seed companies except Syngenta. And perhaps it’s no more fanciful than in the late 1970s and early ’80s when, within a decade, first Big Oil and then pharmaceutical-dominated pesticide companies suddenly moved into seeds. For a brief time, Royal Dutch Shell was the world’s largest seed company and other fossil fuel companies like Atlantic Richfield and Occidental Petroleum were climbing on the haywagon. After all, the fossil majors not only sold agriculture its fuel but also provided much of the feedstock for its fertilizers and pesticides – and had the network of distributors that could make them the “one-stop shop” for farmers. In the end, the cabbage patch proved too complicated and location-specific for the oil patch, but the pesticide companies looked over the fence and they saw, coming down the road, both biotechnology and the patents they needed to monopolize the sector. The thousands of seed companies and hundreds of pesticide companies of the 1970s have more or less morphed into the Big Six vying to become the Titanic Trio today. The Box in the Garden: In 1964, Leo Marx wrote his classic, The Machine in the Garden, mythologizing the psychic impact of the machine on nature and agriculture. Today, everything goes into “the box” controlled by the farm machinery companies: seeds, pesticides and fertilizers go into the box; the box is driven by a robot advised by a drone on a course defined by a satellite; meter by meter, the box’s sensors determine the amount and kind of seeds, pesticides and fertilizers and then the box puts it all in the ground. All this data will be reported by the box to the drone to the crop insurer. The companies that breed the seeds and livestock and manufacture the pesticides are racing to control the data, but they don’t own the box or the robots. Most of all, they don’t have the buying power: seeds are small; tractors titanic. In 2014, Deere & Co.’s farm machinery sales – though down dramatically from even a year earlier – were just over $26 billion - about the same as the combined seed sales of all the Big Six companies. For another perspective, the three biggest farm machinery companies (Deere, CNH, AGCO) accounted for almost half of global farm machinery sales in 2014; likewise, the three biggest pesticide companies (Syngenta, Bayer, BASF) controlled half the global pesticide market. But the combined take of the top 3 machine mammoths is twice the size of the top 3 pesticide peddlers. Deere & Co. may not be riding on the back of a bull market, but BASF’s Plant Science division, in light of the other mega-mergers, might be an option the farm machinery company can’t refuse. Climate: ‘Seed-Change’? 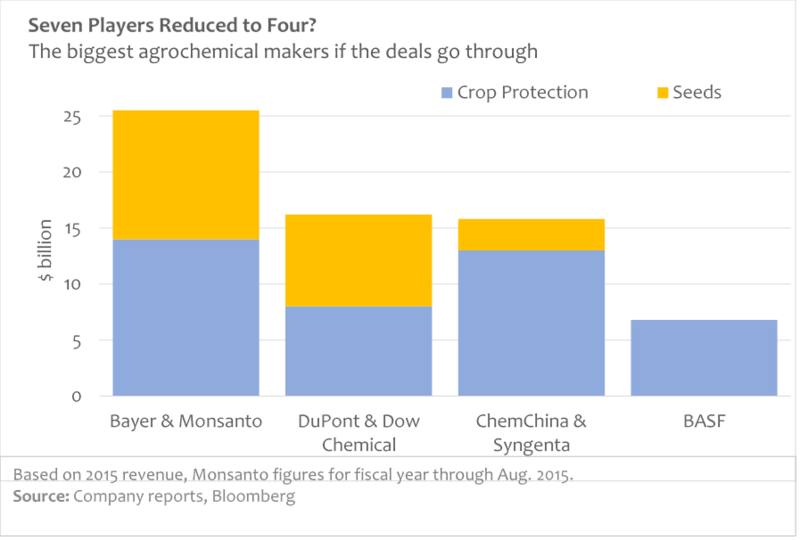 Or Time for the Kickboxer: The trio of mergers now coming before regulators (Dow-DuPont, ChemChina-Syngenta, Monsanto-Bayer?) should be rejected for two reasons: first, as is almost universally agreed, the mergers will increase input prices for farmers even as the companies reduce their R&D budgets and cut jobs. Because the mergers allow synergies between seed and pesticide research (and, of course, reduce competition) rather than respond innovatively to climate-change, the trio will have no incentive to undertake risky research. Secondly, if these mergers are accepted, not only will BASF be in play, but also the three farm machinery companies will use governments’ enthusiasm for so-called “climate smart” agriculture to buy into one or all of the seed/pesticide giants. Having drunk the Kool-Aid served up by the chemical majors, regulators will have no reason to turn away from the farm machinery companies. If the world is going to stop this from happening, it needs to move now. As we’ve said before, mergers are always a dubious deal for shareholders and even if Washington and Brussels give the go-ahead (by no means certain), tough conditions or outright rejections in emerging markets like Brazil and Argentina or India and Indonesia – or even China – could lead to shareholder revolts and an end to the deal-making. Big Data has been in vogue before – sometimes giving precision and clarity and, as often, confusing the scene or narrowing options. Manufacturing got a boost when it embraced Frederick Winslow Taylor’s penchant for measuring human labour in 1911 followed by Henry Ford’s adoption of the assembly line in 1913. By studying the tasks of workers, “Taylorism” measured and crunched data to maximize workplace efficiency (effectively roboticizing workers). Meanwhile, “Fordism” ushered in consumerism (and pollution, traffic fatalities, urban alienation and global warming). Taylorism and Fordism also did much to destroy the dignity of work. Less recognized is that industry’s addiction to data and efficiency truncated the adaptive contribution of workers and blinded managers to alternative production models. The tinkering of artisans, after all, was central to the success of the industrial revolution. Western agriculture produced two other “isms”: in 1896, the American Wilbur Atwater discovered the calorie as a means of measuring food energy and, in 1900, the rediscovery of Gregor Mendel’s Laws of Heredity opened the way to computational plant breeding. “Atwaterism” led to a slavish – and almost exclusive – concentration on the caloric yield of cereals and tubers and an almost complete disregard for the nutritional importance of fruits, vegetables and high-protein crops. Policymakers’ infatuation with calorie counting contorted human nutrition and misshaped the Green Revolution for a century. Mendelism made plant breeding more predictable but shifted breeding from farmers to universities and companies and curtailed farmers’ own decentralized breeding strategies. A technology that could have empowered collective farmer breeding instead reduced breeding opportunities and narrowed crop diversity. Instead of creating diversity, the tools of measuring and manufacturing became reductionistic. Blocking the Box is not a legal manoeuver – it’s frankly political. Politicians around the world are alarmed by the popular discontent popping up in many countries. Protests against the mergers will be noticed and a barrage of petitions to politicians and anti-competition offices will get attention. On April 15, ETC Group convened a conference call with more than 30 civil society organizations and social movements on five continents. Many of those on the call are already moving against the mergers and others are considering action. Since that call, dozens of other national and international CSOs have expressed their opposition to the mergers. On May 21, tens of thousands of marchers in at least 40 countries on every continent protested against Monsanto, spurred on by the news that the world’s least popular company might hide behind Bayer’s skirts. This is the third year the March Against Monsanto has wrapped around the world. [xii] Another leading CSO, Food and Water Watch, is organizing protests against the Dow-DuPont merger in the USA[xiii] and, in Europe, Sum Of Us have a similar campaign against the Bayer/Monsanto merger. [xiv] GRAIN and many other CSOs in China/ Switzerland and elsewhere have also challenged the ChemChina/Syngenta merger. [xv] Simultaneously, GeneWatch UK[xvi] and ETC Group among others are monitoring the companies and providing background. The opposition is not going to go away. The mergers currently in play may well take the rest of 2016 – or longer – to be resolved. That gives plenty of time for discussion and action at the World Social Forum that will be held in Montréal this August. After that, there is the UN/FAO Committee on World Food Security meeting in Rome in mid-October followed by the UN Convention on Biological Diversity’s biennial Conference of the Parties (COP 13) in Cancun, Mexico in December. Each of these fora will take up the implications of the mega-mergers and the implications of the new technologies they portend. In the meantime, those wishing to write to their national (and sometimes regional) anti-competition office will find a contact list attached to this report and on ETC Group’s website. [i] See Professor Phil Howard’s work on Seed Industry Structure, including cross-licensing arrangements amongthe Big Six: https://msu.edu/~howardp/seedindustry.html. [ii] Peter H. Diamandis and Steven Kotler, Bold: How to Go Big, Create Wealth and Impact the World, Simon & Schuster, 2015, p. 64. [iv] Kana Inagaki, “Yamaha aims to unlock US and EU markets with agricultural drone,” Financial Times, 05 July 2015: https://next.ft.com/content/626684e2-2181-11e5-aa5a-398b2169cf79. [v] Antonio Regalado, “DuPont Predicts CRISPR Plants on Dinner Plates in Five Years,” Technology Review, 15 October 2015: https://www.technologyreview.com/s/542311/dupont-predicts-crispr-plants-on-dinner-plates-in-five-years/. [vi] Heidi Ledford, “CRISPR, the disruptor,” Nature News, 03 June 2015: http://www.nature.com/news/crispr-the-disruptor-1.17673. [vii] Antonio Regalado, “The Next Great GMO Debate,” Technology Review, 11 August 2015: https://www.technologyreview.com/s/540136/the-next-great-gmo-debate/. [viii] Andrew Pollack, “Scientists Talk Privately About Creating a Synthetic Human Genome,” New York Times, 13 May 2016: http://www.nytimes.com/2016/05/14/science/synthetic-human-genome.html. [x] Along with Google and Apple we could also add Tesla, an electric car company built by an IT geek who got his wealth from PayPal. It is interesting to note that as of the end of May, 2016, virtually every conventional automobile maker from German and Japan is making deals with software companies in the hope of beating back the advances of the giant IT platforms. [xi] While much has been written about Henry Ford and F.W. Taylor, there is considerably less about Wilbur Atwater or Gregor Mendel. In his excellent book, The Hungry World, Nick Cullather clearly describes Atwater’s influence over the measurement of hunger and the eventual direction of the Green Revolution. Likewise, Jonathan Harwood’s book on Europe’s Green Revolution shows us how the rediscovery of Mendel’s Laws in 1900 – rather than giving farmers new plant breeding strategies – turned into a tactic that allowed university research stations and private companies to push out farmer plant breeding in Germany and other parts of Europe over the first three decades of the 20th century. In addition, Noel Kingsbury’s, Hybrid, and Ford Denison’s, Darwinian Agriculture, make it clear that Mendel’s triumph was not automatic and was at the expense of complementary technologies. See Nick Cullather, The Hungry World, Harvard University Press, 2010; Jonathan Harwood, Europe's Green Revolution and Others Since, Routledge, 2012, Noel Kingsbury, Hybrid – The History and Science of Plant Breeding, University of Chicago Press, 2009; R. Ford Denison, Darwinian Agriculture: How understanding evolution can improve agriculture, Princeton University Press, 2012.